The ships’ demolition activity has began to feel the weather effects of the Southeast Asia region. In its latest weekly note, Clarkson Platou Hellas commented that “as the monsoon rains begin to slow productivity down in the Indian sub-continent, a reflection of this slow period has been reflected in the very few sales candidates to enter the market this week as many Owners now understand the difficulties associated in trying to sell their units during this seasonal lull and the difficulty recyclers have whilst the heavy rains hamper their yards. This has resulted in stagnate conditions with little movement in rates but with sentiment slightly cooled across India and Bangladesh respectively. It is, however, interesting to note the first Owner to consider a ‘Green Recycling’ sale into Bangladesh. The PHP Yard, following it’s well publicised endorsement by Rina class for Green Ship recycling in accordance with the H.K. Convention, has finally acquired their first vessel, being the VLOC ‘Ore Vitoria’, and congratulations are due to the Owners of this yard following the impressive upgrades to their facilities. All stakeholders in the industry will watch this transaction closely to see how it materializes, as if successful, other owners may also start to consider this yard as there have been question marks in relation to the disposal of the actual hazardous materials. The Pakistan steel markets rallied this week providing some respite to recyclers after the recent currency devaluation and tax upheavals which may help rebalance sentiment in this destination after what has been a subdued time for the Gadani recyclers. 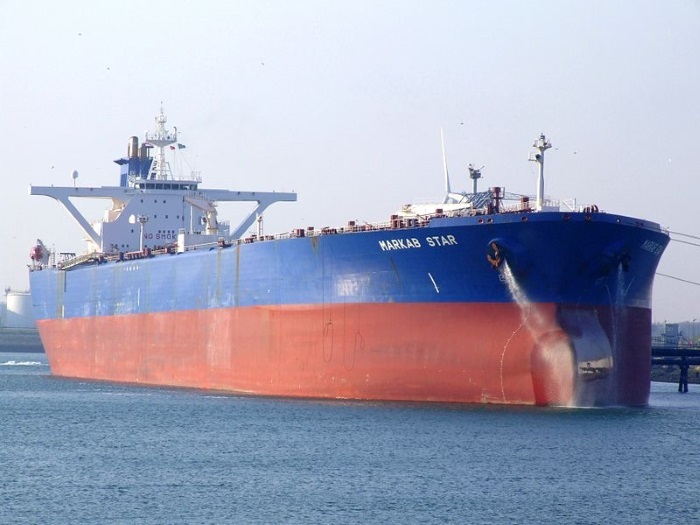 However, and as previously reported, there is still yet to be any cutting permissions granted for the currently beached tankers which, if continues, may impact financial capabilities when offering for new tonnage being made available”. 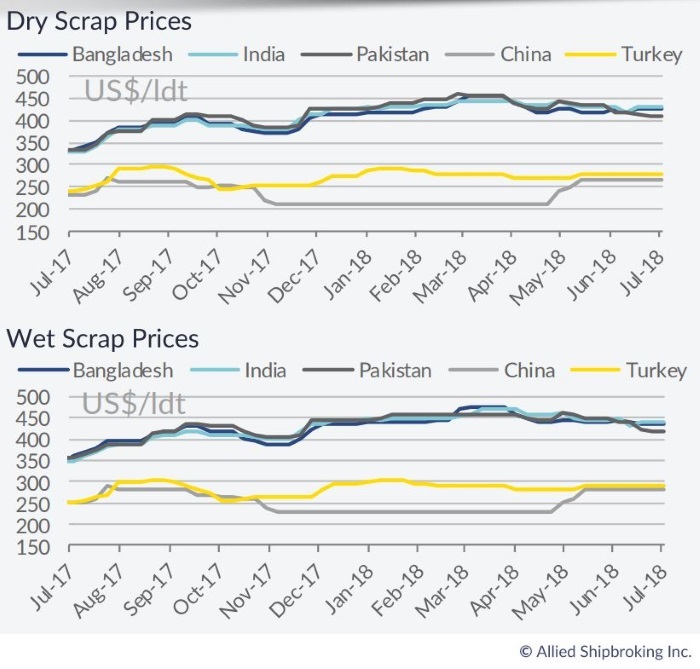 In a separate note, Allied Shipbroking added that “as we are moving deeper within the summer and monsoon period, the sluggish mode in the recycling market is becoming ever more prominent. So far, most apparent is the declining trend noted in terms of volume, where for a period now, the availability of fresh demo candidates is becoming even more stringer. Notwithstanding this, offered numbers have shown an impressive resilience to the downward path that the whole demolition market has felt as of late. In the Indian Sub-Continent, things remain rather foggy for the time being, with Pakistan having been relatively absent as of late, while India has witnessed a significant drop in local steel plate prices. Given that the whole region is still in the process of trying to handle the excess tonnage that was snapped up in previous weeks, we may well expect the remainder of summer period to be relatively “light”. With all being said, it is most probable that we have to remain patient until the start of autumn, in order to see things gear up once more, while a lot will depend on the state of the tanker sector, in which the demolition market has come to be greatly dependent on throughout this year”. Meanwhile, according to GMS, the world’s leading cash buyer, “sub-continent markets are presently enduring a mid-summer slump with decreasing demand and struggling local fundamentals, leaving Cash Buyers with tonnage in hand, unable to offload their inventory at anywhere near breakeven levels as end Buyers refuse to offer anywhere near asking prices. The Indian market has been hit the hardest of late, with almost USD 50/Ton wiped off local steel plate prices over the last two weeks whilst the Indian Rupee depreciated to a worrying level in the high Rs. 68 against the U.S. Dollar, leaving the currency markets in turmoil. As a result, Alang offerings have declined leaving India in second place on the market ranking. Bangladesh too has suffered another frustrating week as the constant monsoon rains hamper cutting activity and output of ship’s steel. Additionally, very few banks are presently willing to sanction LCs for new vessels as a result of which, local fixtures have declined and local port position in Bangladesh (and Pakistan) is facing an excruciatingly minimal number of fresh arrivals, a situation that is expected to persist in the short run. In Pakistan, ever since the market reopened for tankers towards the end of April and despite a multitude of (wet) units being beached here over the past few months, authorities have yet to give cutting permission and the PSBA are due to meet with local authorities in the coming week to ensure permissions are granted. Moreover, the imposition of the 10% sales tax from July 1st and a recent currency depreciation have both helped prices in Gadani plummet of late. VLCC levels in the region of USD 410 – USD 415/LDT are being discussed and demand for fresh units is virtually non-existent at present, whilst yards remain stuffed with tonnage. 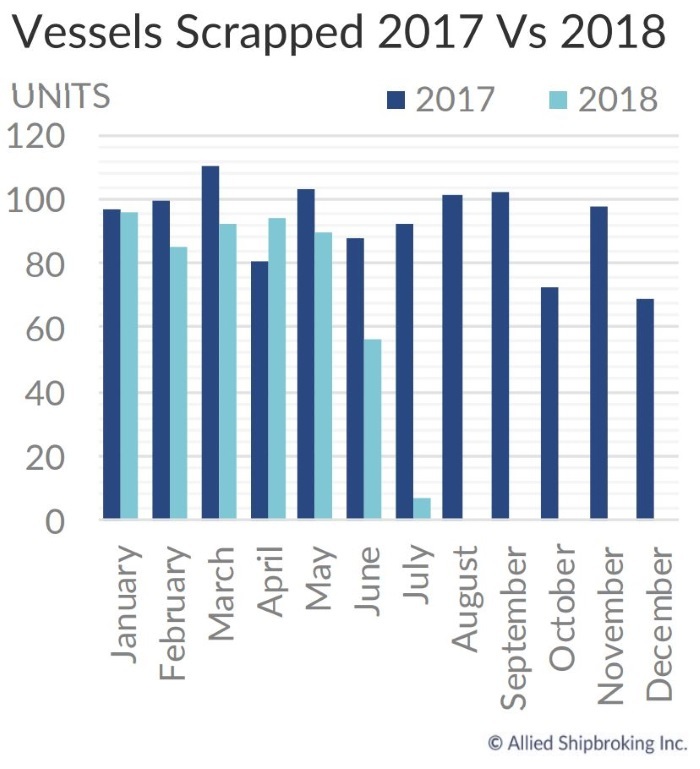 Finally, supply too has remained steady with rates on wet units failing to improve and many vessels approaching their SS / DD due dates, which in turn has put further pressure on prices across the board”, GMS said in its latest weekly report. Previous: Shipping’s Half Year Report – Extra Classes Needed?